Students are starting the school year off right with plenty of school supplies and gear to use in the classroom. On September 7, 2018, R.L. 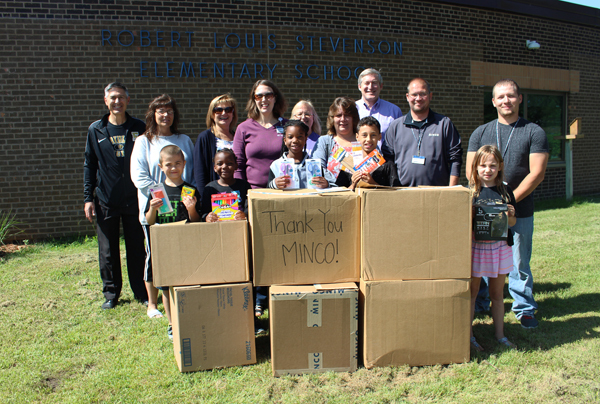 Stevenson Elementary received a kind donation from local business Minco, an international company with its headquarters based in Fridley. Minco provides engineering solutions for thermal, temperature sensing and control and flex circuit technologies for a variety of industry sectors. This is the second year that Minco has donated to support students at Fridley Public Schools. Senior Financial Analyst Angela Barta, who helped organize this community outreach effort, said the company is excited to contribute and support students at Stevenson Elementary. “Since Minco has been around for over 60 years, we felt that as a company, we should do something to support our community,” said Barta. Through several employee fundraising efforts, Minco raised over $1,000 to donate to Stevenson. The company also held a school supply drive and collected over 500 items to donate to students, including 120 headsets for students to use with computers and iPads. Additional community organizations that donated to assist fundraising efforts included Red Savoy Pizza, Aramark, Walmart and Fastenal.